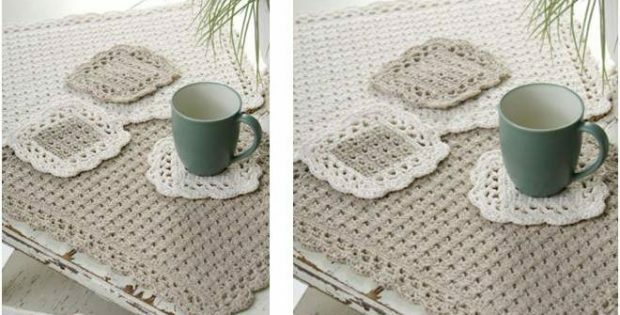 Beautify your kitchen with this classy Options crocheted placemat set. It comes with lovely crochet placemats and dainty coasters. The smart design will definitely add a touch of elegance in your home. Once completed, the crocheted placemat should measure approximately 14 inches by 17.5 inches, while the crocheted coaster should be about 6 inches across. In metric units, the finished crocheted placemat should have a size of around 35.5 cm by 44.5 cm, while the crocheted coaster should measure roughly 15 cm in diameter. This crochet pattern is another lovely design by Marilyn Coleman. In fact, you can access the FREE downloadable pattern for this beautiful table setting from the Red Heart website. To access the FREE downloadable pattern for this gorgeous kitchen set, please click on this link: Options Placemat & Coaster Pattern.